Huntsville Search Engine Optimization. Rocket Social Marketing is the only marketing agency in Huntsville that solves the 3 major problems that all businesses have with search engine optimization. To read about these problems, click on this link to read the article: 3 Reasons Why SEO Isn't Good Enough Anymore. If you are a local, service-based business, then it's critical for you to optimize your Google Places page, and not just your website. This is explained in the article above. Also, it is extremely important that you have the proper content prepared on your website to ensure that your prospects choose to do business with you instead of your competitors. Rocket Social Marketing creates this content for you and then prepares a strategic marketing "Master Letter" which forms the basis for all of your marketing collateral. This strategic marketing content is then delivered to your prospects in the form of marketing tools like: videos, reports, audio programs, direct mail, sales scripts, etc., and it's even "delicately weaved" into your SEO program. No other SEO company can offer this to you—nobody! Go ahead and check for yourself. The total population within a forty-five minute drive of Huntsville is over 500,000. This is a huge market base for any business in the area, and most of those 500,000+ people are going to use the internet to search for the goods and services they need in the Huntsville area. How do you make your website stand out among your competitors? How do you make certain that when they search for what you offer your site not only comes up, but grabs their attention and causes them to choose your business? In Huntsville, SEO is just as important as it is anywhere else, but there is more to it than SEO. SEO, or search engine optimization, is the term used to describe the strategic placing of keywords in web content to cause the content to appear in search results when those key words are searched. In the early years of SEO, there were few restrictions on this. Keyword stuffing, or the random placing of keywords in content where they did not even make sense, was rampant. If you searched a keyword you may or may not get results actually related to what you are trying to research. The information on the pages may or may not be useful, and there was a lot of frustration. In the world of the internet, as well as in Huntsville, SEO has changed. Search engines, most significantly Google, have changed the way the SEO game is played. Now everywhere, including Huntsville, SEO is more than just stuffing keywords as frequently as possible. Most article directories will not accept articles that do not make sense and do not offer useful information. This means that while the keywords are still there, they are incorporated in such a way that they blend well with the useful information in the article. There are also content mills that will write content on whatever subject you wish and however you wish for a fee. There are a couple of problems with this however. These writers often write content for hundreds of different sites using as many or more keywords per week. This can make it hard for them to make your content truly unique to your site. They also can be from anywhere in the world, which would make it hard for them to specifically utilize Huntsville area keywords in order to tailor your site to attract business from the Huntsville area. When you procure our SEO services, these problems disappear. We have a team ready to work with you personally to ensure that your website content uses keywords in a way that not only puts you at the top of the search results, but that also offers real, usable information to your target market. This will make all the difference because, while SEO gets them there, the content in which those keywords are embedded is what will actually makes them believe they need what you have. Another advantage of using us for your SEO needs is that we can offer the total package. Your entire marketing campaign can be consistent from start to finish, including SEO, web content like video and social media, web design, and even the rest of the campaign that takes place outside of the web. Since we also offer full-service printing, choosing to use us for all your needs had definite advantages. The pieces just fit together better, and with all of them in line from the beginning, the result is more web traffic and increased profits for you. Choosing us to handle you optimization needs ensures that your content puts you at the top of the search engine results. Content that is both useful and utilizes the proper keywords is included, as is a master profile that combines the same theories in various forms such as direct mail, audio programs, and videos. It will all fit together to create a complete SEO marketing campaign tailored to your company and your website. 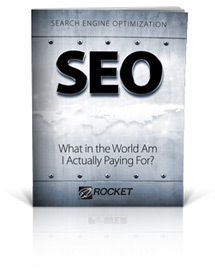 Rocket Social Marketing is the only company that offers a complete package such as this. 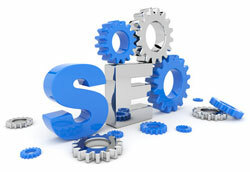 We combine your SEO needs into all marketing aspects of the company. We do it, we do it well, and we can do it for you.